Few can be encouraged to visit Mongolia, but the brave-hearts are likely to leap in excitement on the mention of Gobi Desert, Airag and Dinosaur eggs. Mongolia is a country where life begins where paved roads end. Mongolia’s unique landscape makes it a place like no other – it is a country of sunshine and more animal to human ratio. The idea of leading a nomadic life in a ger, milking goats under the open skies in Chinggis land is romantic and no other place in the world gives you the impression of space or being one with the stars. But amidst the scores of livestock roaming free, you see the signs of changing lifestyle – solar powered washing machines and refrigerators in gers and modern day herders on bikes! What Mongolia is well known is its variety of landscapes from steppes, valleys, mountains to deserts. 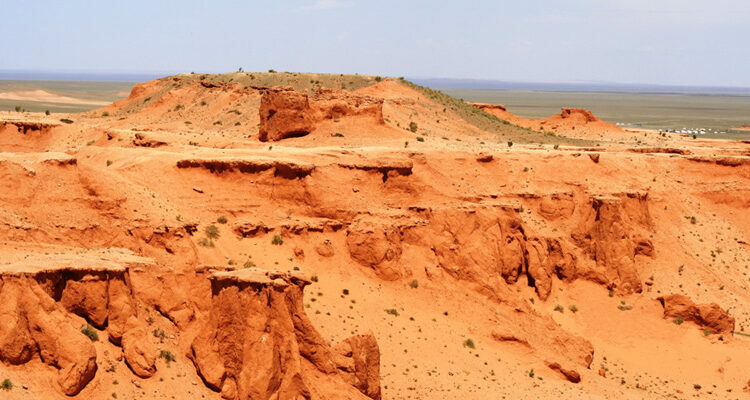 In the Gobi Desert, I have been fortunate enough to witness a wide range of different landscapes – valleys of Yol, the green rolling hills of Khogno Tarna, and the desolate rock formation of the Flaming Cliffs. Not to mention, the century-old nomadic lifestyle perfected over the years, the mysterious culture of Shamanism and Tibetan Buddhism and you will get to experience all of that in the Gobi Desert. The friendly people of Gobi. I’ll start with the people. The real reason for visiting, apart from the ones I mentioned, should be the people. 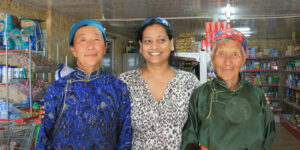 Never have I met such incredibly friendly people like I did in Mongolia! Out in the Gobi Desert, staying with them in their homes or gers is so much like being with family. They are still quite unchanged from 3000 years ago, especially in the desert, relying largely on goats, sheep, horses and yak for their livelihood but sharing with their hearts open. That said, you are not going to spend your days here merely talking to people, right? 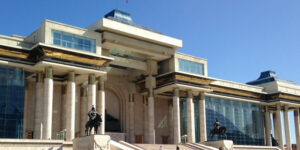 So what can you do when in Mongolia? Also, be warned that Mongolia is not your luxury holiday destination and your chances of finding yourself a hammock to lie is non-existent as would be a spa, Michelin restaurant and night markets. Mongolia is basic and very connected to nature. However, the capital Ulan Bator will give you those choices too. Ulan Bator, the capital city is quite modern. This is where you will find your usual malls, restaurants and salons. That aside, as a first time visitor, you will inevitably end up at the Sukhbaatar Square. This is where all the museums are located. Some excellent exhibits displayed here will acquaint you with much of the country’s history. On a Sunday evening, you may be able to see some concerts or cultural events happening in the square. Enter the National Museum and you will learn that there was once a Mongolian cosmonaut who went to space! I bet you didn’t know this before. You will also see how big the actual Mongolian empire was. 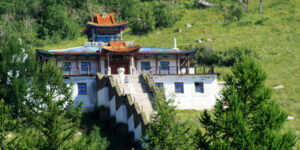 Head to the Winter Palace of Bogd Khan to get a glimpse of what the Tibetan religion is like. Next, head to the Zaisan Monument, a Soviet-era monument depicting a beautiful illustration of the camaraderie between soldiers who fought in wars. It is a pretty sharp walk to the top, so be prepared. Let me be honest – Ulan Bator doesn’t have too many must-sees or things to do, but there is nothing to beat the vibrancy of its Naran Tuul Market and monasteries. Also, if you intend to go into the desert, this is where you should exchange your money; buy your snacks or SD cards. If you are feeling particularly rich, buy your wools here – especially cashmere. 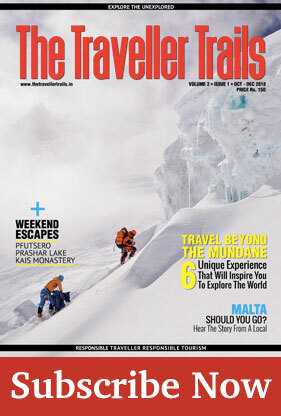 SO, AFTER A SOJOURN IN THE CITY, WHAT WILL YOU DO NEXT? 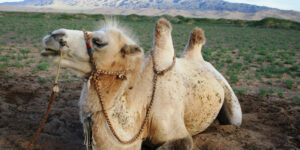 I STRONGLY SUGGEST TAKING A GOBI DESERT TOUR, OF COURSE! The Gobi Desert is such a fascinating place to be. Okay, so you cannot just drive in or around or through Gobi in merely a day. This trip should be given at least 6-7 days (or at least 3 for a shorter trip) but this journey will change your outlook of life forever, while also teaching you geography, a little bit of zoology and botany, astronomy (how else did the nomads keep time or judge seasons or distance!) and a lot of patience. You will go through different seasons and regions all in one trip – from singing sand dunes to valleys covered with ice and cliffs and streams. 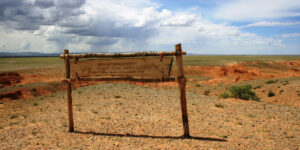 When traveling through Gobi, you will come across mounds of stones placed at strategic locations. 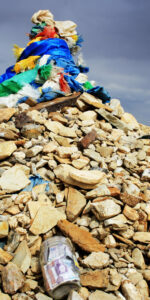 Interestingly, this stone heap is supposed to bring good luck to travelers. 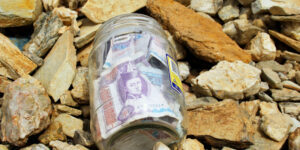 What is even more interesting is that the Ovoo is demanding – for example, you are required to throw a stone into the heap, go around the pile thrice, leave offerings of vodka, money or milk. But Ovoo is also very considerate. If you are in a hurry, you simply honk at it and go on your way. 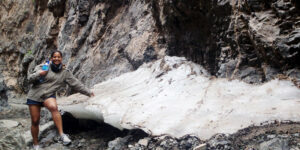 Ice blocks in Yol Valley. 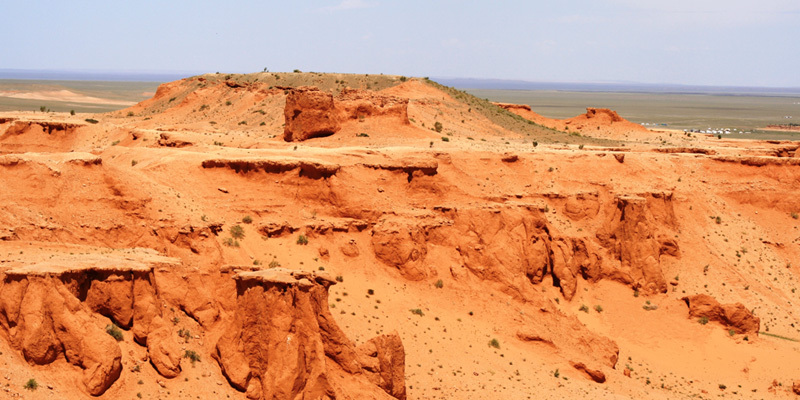 The most dramatic part of your Gobi tour is Yol Valley. Yol Valley is easily one of the best kept secrets of the desert. The beautiful deep canyons with rocky cliffs are anything but fascination. The canyon is so deep and narrow that you will be forced to walk in a single file. Strange as it might sound, the temperature here is very low and you might actually freeze! Carry warm clothes. Mongolia has lots of sunshine, but out here the canyon remains dark and a part of the river at the bottom remains covered in a thick layer of ice all year! Ride the humped camels at Khongoryn Els. To the south of Gobi, the Khongoryn Els rise high into the skies. This is also the best part of the trip, in my opinion. This part of Gobi extends right up to the Altai Mountains, so the backdrop is mind blowing. This is the place where you can ride a camel and hear the sand sing! If you feel up to it, a good idea would be to hike up the sand dune to watch the sunset – nothing comes close to the feeling of watching the sun go down and listen to the shifting sands…As the sun goes down, the sands turn golden… Getting up the sand dunes might be a little tough, but running down is a pleasure! The deep orange Flaming Cliffs is a definite shocker! It is hard to imagine something so beautiful and enchanting in the Gobi. What is even more interesting is that the first dinosaur eggs were found here by American paleontologist Roy Andrew Chapman. Here you can’t see the remains of course, but the dinosaur fossil is housed in a museum in Ulan Bator. The sandstone cliffs turn bright orange at sunset –and if you happen to be camping nearby, it is worth waking up early while the moon is setting so you can be greeted with a glimpse of the Milky Way. A short distance away from the capital city (and the last stop of your Gobi tour), Terelj National Park will come as a surprise to you. You will of course live in a ger, but the gers here are “mini hotels”. When you are here, hike up to one of the monasteries on the side of the cliff to get the view of the whole park. Plenty of impressive rock formations set among scenic valleys is enough to keep you occupied. One of the most famous of these rocks is the iconic Turtle Rock could be just your thing. Another interesting thing to do is to visit the Aryabal Meditation centre – this is however located on a steep hill but the views from here make up for the effort. Along the path, you will see Buddhist teachings on signboards – so double the time you’d normally take. 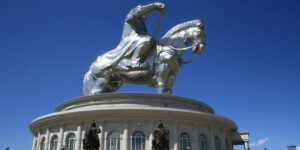 Genghis Khan Equestrian statue at Ulan Bator. Later, when you have had a fill of nature, visit the massive Genghis Khan statue and go up on his horse and to the lookout point to see the beautiful landscape of Mongolia. After their independence from Russia, Mongolians installed a 131 foot tall Genghis Khan Equestrian Statue which looks so out of place in the Mongolian steppe but conveys the emergence of a new Mongolia. The statue is the tallest man-on-a-horse statue in the world and sits 40m above the ground. As the evening progresses, livestock is herded together for the night. 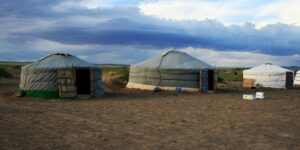 For thousands of years, Mongolians follow the nomadic culture, moving livestock and home depending on the season. The food variety is constant in the Gobi – buuz, fat-rich meat soups, potatoes and noodles. Well, there is aarul (dried yogurt) and airag (fermented mare’s milk) that adds to the occasional variety. The one thing you should absolutely try is the salty milk tea. While it might not sound very appealing, it is delicious and goes very well with the climate of Gobi. Yes, you should go to Mongolia! But let me sum this up – if you are interested in escaping to a less touristy destination, absorb nature, culture, vast, open spaces… because nothing gets better than Mongolia! It stirs your soul, makes you want to reconnect with yourself and the world around you. • Mongolia is one of the most sparsely populated nations in the world, with only 4.3 people per square mile. • There are 13 times more horses than humans in the country and sheep outnumber humans 35 to 1. • Mongolia is known as the “Land of Blue Sky” because it has 260 days of sun a year. When to go: Mongolia gets extremely cold in winter. So the best time would be the months between June and August. 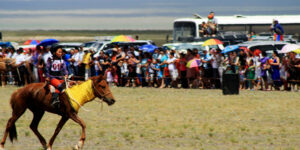 If possible, July should be an ideal month, because it is the season of the Naadam Festival when wrestling, archery and horse racing turns the country into one big sports-field. • Clothes for the whole trip including some layers (1 fleece jacket and outer shell jacket) as the desert can get real cold sometimes. • Snacks: You will be riding for at least 5 hours to prepare your food intake accordingly. • Toilet paper: This is very important. Toilets don’t exist and except for a hole in the ground, don’t expect much. • Power Bank: Even though you usually stop at a proper restaurant with power outlets every 2 days, you bet there will be a lot of people trying to charge their stuff as well so it’s better to have a backup. • Wet wipes: Very handy in the absence of showers. 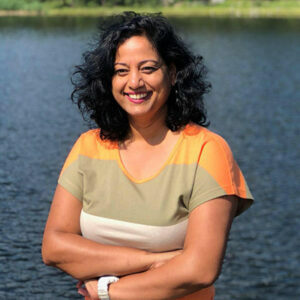 Anjaly Thomas is a lawyer-turned traveler and writer. She has authored four books till date including one on North Korea. Currently based in Dubai, she has travelled to over 65 countries till date.